Thanks to our great nofightin.com readers for turning us on to so many great photos and recordings in the last month or so. As we continue to collect more stuff, we’ll continue to share with you. 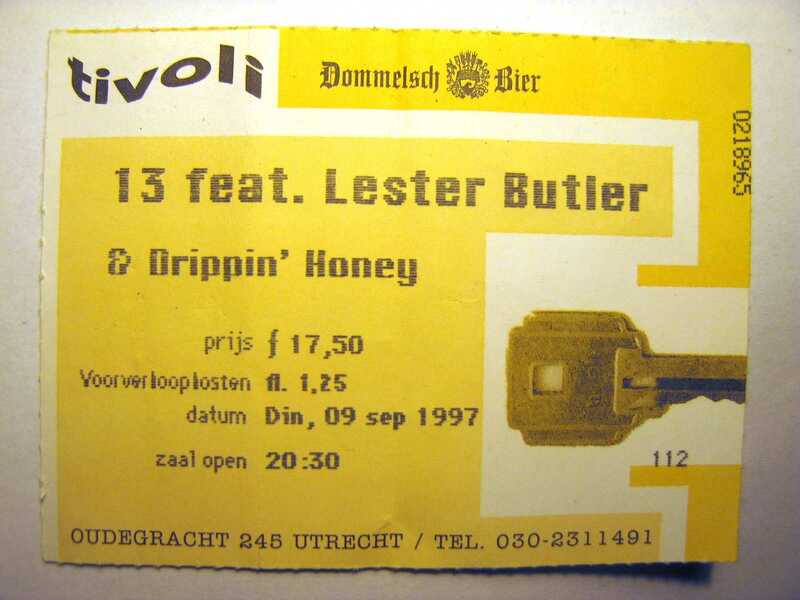 Reader Harry sent us this concert ticket for 13 at the Tivoli, Utrecht, The Netherlands. The date is Sept. 9, 1997, and Harry remarks, “It was a great show!” European blues band Drippin’ Honey was also billed. This entry was posted on January 10, 2010 at 12:14 pm and is filed under 13 with tags 13, drippin honey, lester butler, ticket. You can follow any responses to this entry through the RSS 2.0 feed. You can leave a response, or trackback from your own site.